Committed to nurturing and strengthening student engagement and leadership through service-learning experiences. Students enrolled in the Upper Division pre-licensure BSN program are eligible to apply for the honors program during their second semester of study at Allen College. The Honors Program consists of three, one credit hour courses taken sequentially during the final three semesters of the program. 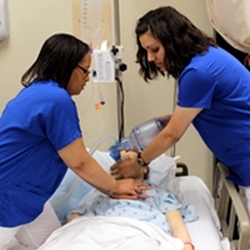 These courses may be used to fulfill the nursing elective or a general education elective requirement. Teaching strategies used in these courses include face-to-face seminars, on-line discussion, and service-learning experiences. Introduction to Service Honors will introduce students to the service honors program. It will provide experiential learning to students as they explore the opportunities for service that exist in the community. During this course, students will engage in critical reflection while learning about community needs and developing initial plans for a service-learning project at a community agency. Students will complete a minimum of 15 contact hours at community agencies during this course. Service Honors Seminar will provide experiential learning to students as they focus on developing a project for implementation at a select community agency. During this course, students will engage in critical reflection while developing a service-learning project proposal. Students will complete a minimum of 15 contact hours at their selected community agency during this course. Service Honors Practicum will provide experiential learning to students as they implement a project in a community agency. During this course, students will engage in critical reflection implementing and evaluating a service-learning project in the community. Students will complete a minimum of 15 contact hours at their selected community agency during this course.